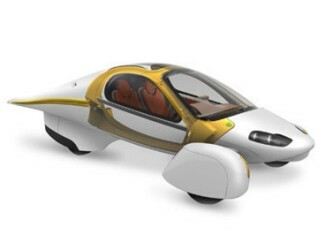 The Aptera 2 Series will be a two-seat, three-wheeled passenger vehicle. It is planned to be available in both all-electric (2e) and series hybrid (2h) configurations, at prices ranging from mid-twenty to mid-forty thousand dollars. By mid-2008, aerodynamic optimization using simulations and light-weight composite construction yielded a prototype which allegedly consumed only 80 Wh/mi at 55 mph, less than half the energy needed to propel the EV1 or the Tesla.The April 14, 2010 press release revised the design intent vehicle efficiency estimate to about 200 Wh/mi, 100-mile range from a full 20 kWh battery pack, or around 200 mpg equivalent. On the hybrid vehicle, it leads to projections of 130 mpg on gasoline alone, or 300 mpg if plugged in every 120 miles. Since then, the vehicle underwent a series of redesigns, including the addition of side mirrors and expansion of the interior space, however, retaining its three-wheel configuration and its trademark teardrop shape. As of February 2010, Aptera 2e's fuel efficiency has not been independently tested; any estimates remain speculative and subject to change. Aptera Motors emphasizes that safety was not traded off for efficiency, citing crash test simulations and more recently component crush testing as indicating excellent survivability–on par with more conventional vehicles. Real-world crash test results are forthcoming, however. The Aptera 2 Series features optional roof-mounted solar panels for running a heat pump, always-on climate control, and keyless ignition and entry. An in-car touch screen computer serves as entertainment, navigation, and communication system. Side mirrors recently have replaced rear-view cameras, though one center-mounted camera remains.